Graz is Austria’s second city and one of culinary pleasure. It is the capital of the Styria region, an area renowned as the ‘green heart’ of Austria, because of its excellent produce. So where better to enjoy a visit to some Austrian Christmas markets than in a gourmet centre and a wine lovers haven? We’ve visited a few Austrian Christmas markets – from the grandeur of Salzburg to the modern cool of Vienna and Linz, plus the nation’s most famous festive town, St Wolfgang. Graz promised something new though and it was not just the great food and wine in this gourmet centre. The city has 14 different Christmas markets – a challenge to see them all in just two short days – but we did manage nine of them. 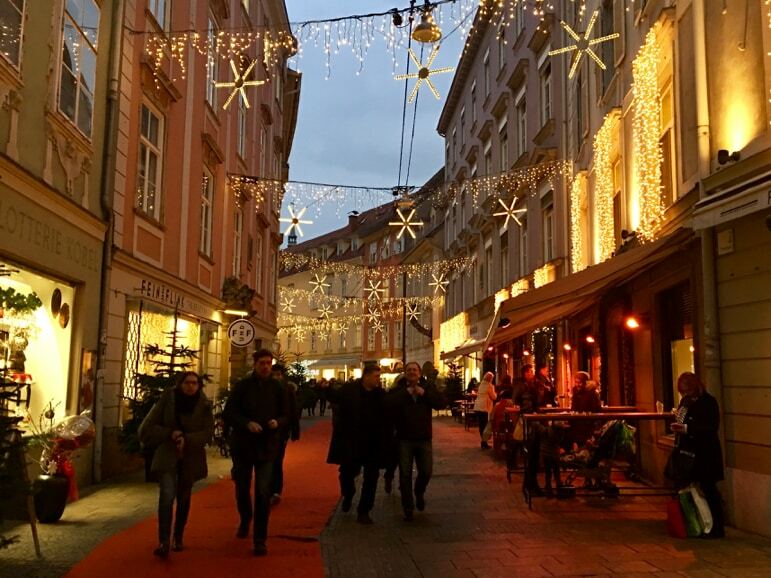 A small city of up to 300,000 people, Graz keeps the Christmas festivities accessible – the markets are all within walking distance of each other. Many of the markets are themed, some aimed at children such as the Kleine Neutorgasse, there were charity markets such as at Eisernes Tor, while others focused on food, drinking (mostly the local wines and schnapps), or entertainment. There is nothing mundane about the Austrian Christmas markets in this city. Of course we had to sample a little something from each market. We bought wine, jams, chocolates and Christmas decorations, our friends and family assured to receive unique gifts, which is one of the best aspects of Christmas market shopping. Naturally, to warm us up on the chilly winter nights, glühwein was our drink of choice. But in Graz, at the heart of one of Austria’s largest wine-producing regions, glühwein comes with options. 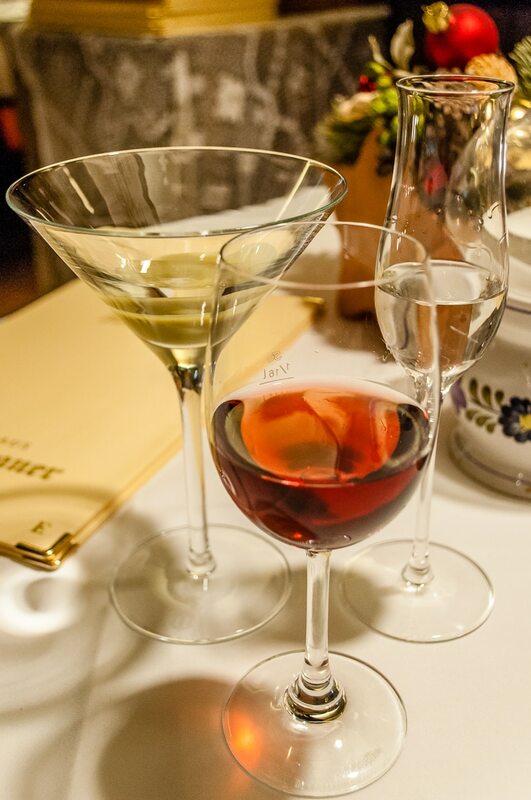 Traditional spiced, red wine is offered up, but there’s also Schilcherglühwein, made with the rosé Schilcher wine, which is produced only in West Styria from the indigenous Blauer Wildbacher grape. Fuelled by the best grapes from the region, we took to the streets to discover more of Graz with Ruth, a local city guide. 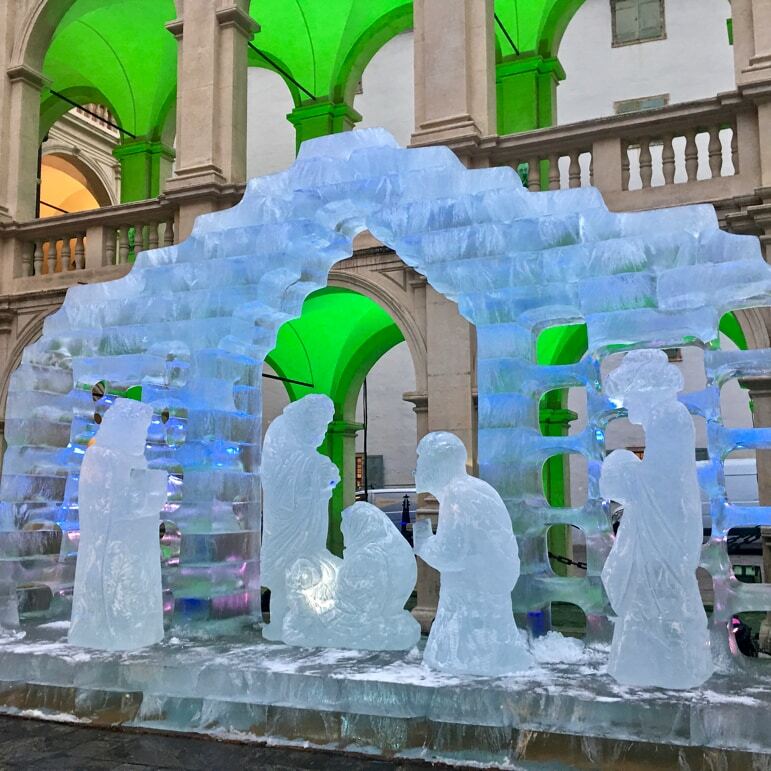 One festive landmark she revealed to us was a life-sized nativity scene carved from ice in the courtyard of the Landhaus, the 15th century building housing the provincial parliament of Styria. Ruth, told us that should it melt, there is also one back up ice sculpture available, but it wasn’t likely even in Graz’s milder climate. 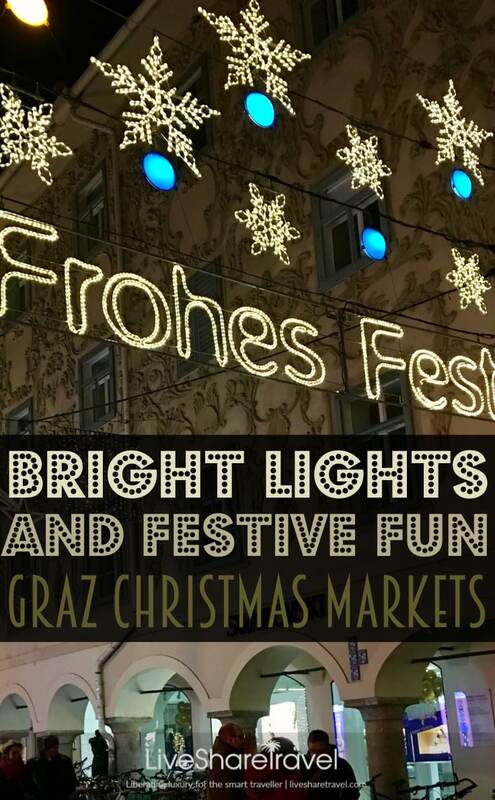 Christmas markets in Graz opened for business at the start of November. Generally they start each day at 11am and shut between 8pm and 11pm, depending which market you visit. One of our favourites was at the Schlossberg, the site of a former fortress topping a hillside. Access to the Schlossberg is via a funicular, a lift, or the more challenging stairs and it provides a great vantage point for views over the city. Up at the top, within the cavernous, aged brick walls of the fortress stalls bulge with local delicacies from schnapps to wine and deli items. 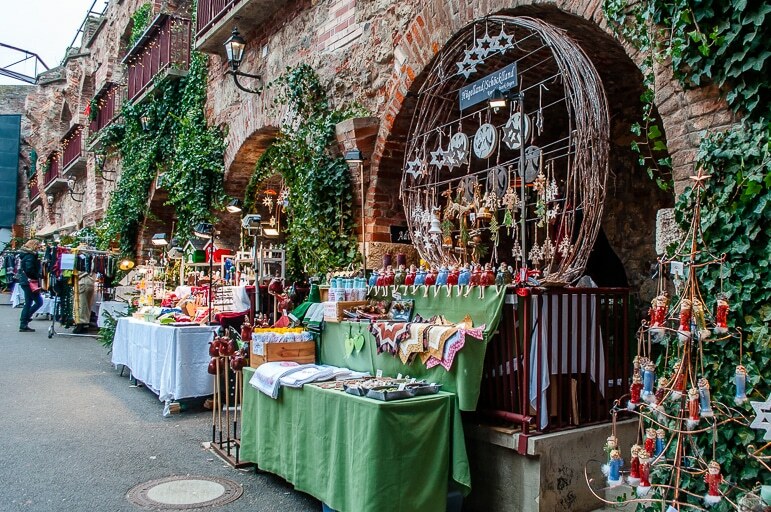 Then there’s handicrafts, from wood carved items to murano glass, and more decorations. 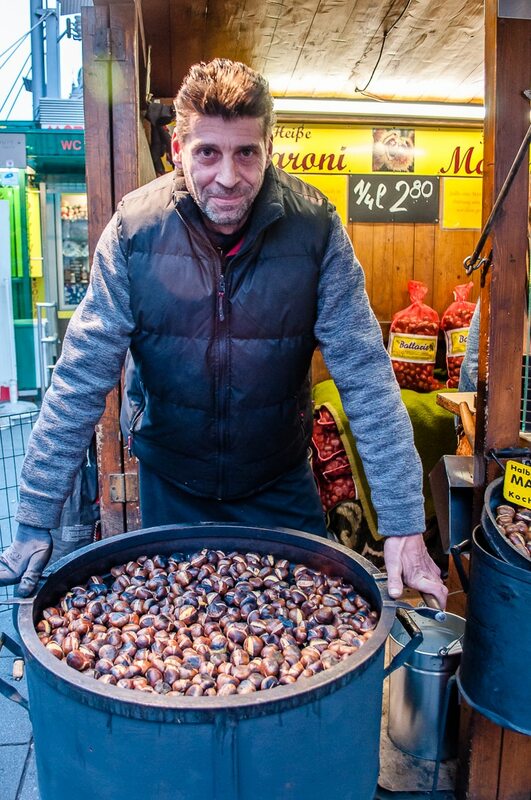 It’s warm, cozy and local – just what you’d expect from a great Austrian Christmas market. Then in the heart of the city you’ll find another Christmas market in the main square, Hauptplatz. 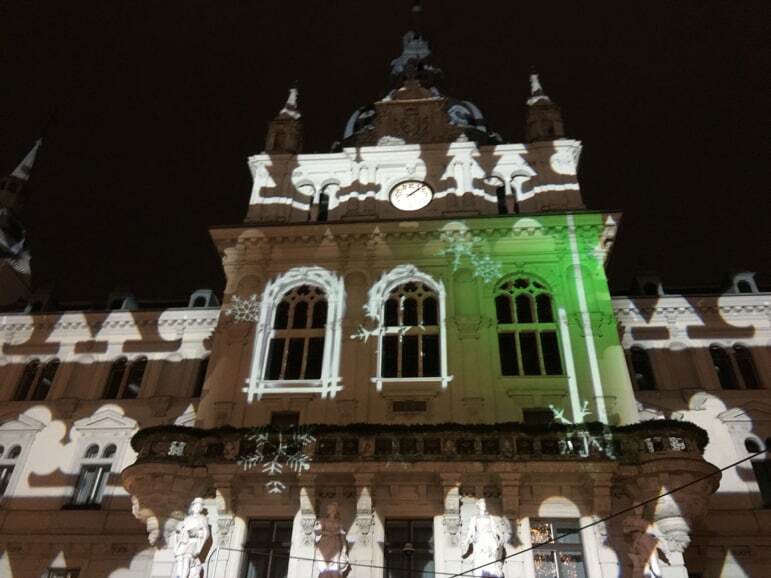 The Town Hall stands at the head of the square, its façade is colourfully illuminated with a festive and atmospheric light show during the Christmas period. Hauptplatz’s market is one for fun with friends – a place to eat, drink and be very merry. It’s also home to a sausage stand that local boy Arnold Schwarzenegger always visits when he makes his twice-yearly return to Graz. 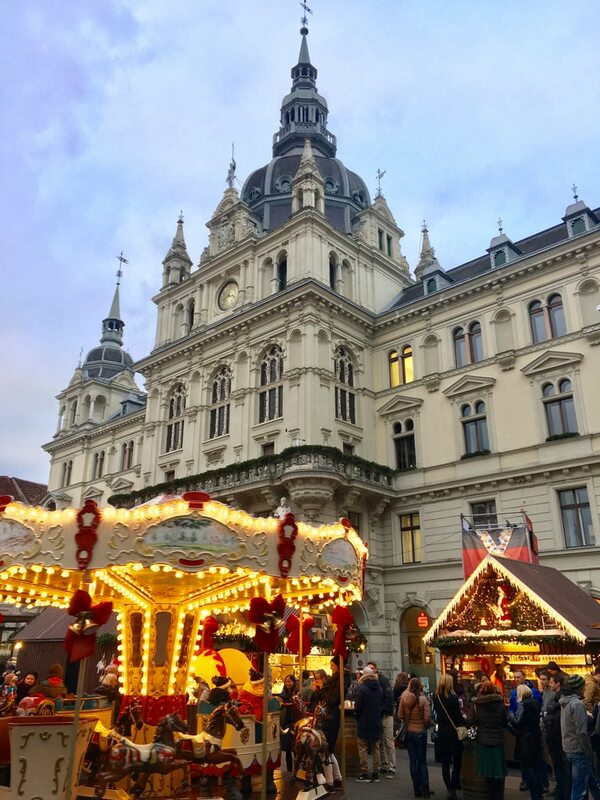 For now our Austrian Christmas market experience is over, but the memories of Graz’s festive magic will linger. Meanwhile the delicious dining we enjoyed in Graz will require my belt to be let out one notch extra – and all before Christmas! Graz’s gourmet reputation is played out in an abundance of restaurants. The popularity for eating out in Graz is high so be sure to book a table in advance, especially at Christmas time. 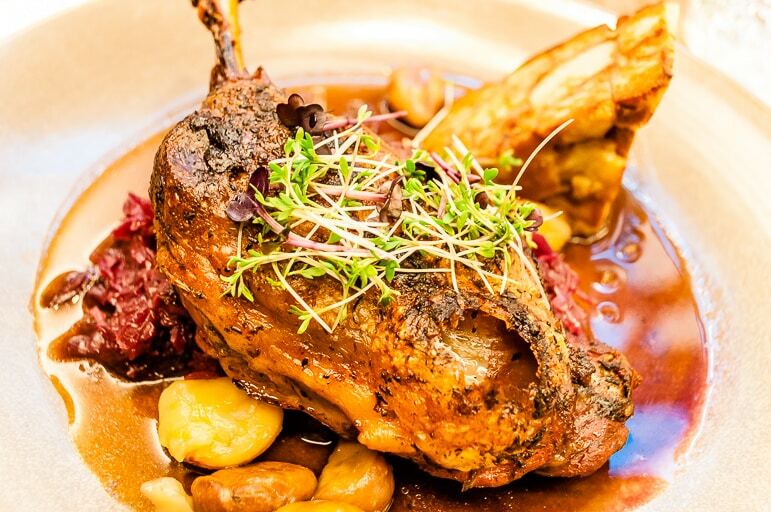 We can recommend the Stainzerbauer restaurant, which serves up choice products from Styria in a seasonal selection of dishes. Housed in a very old building, it has a beautiful character to it. 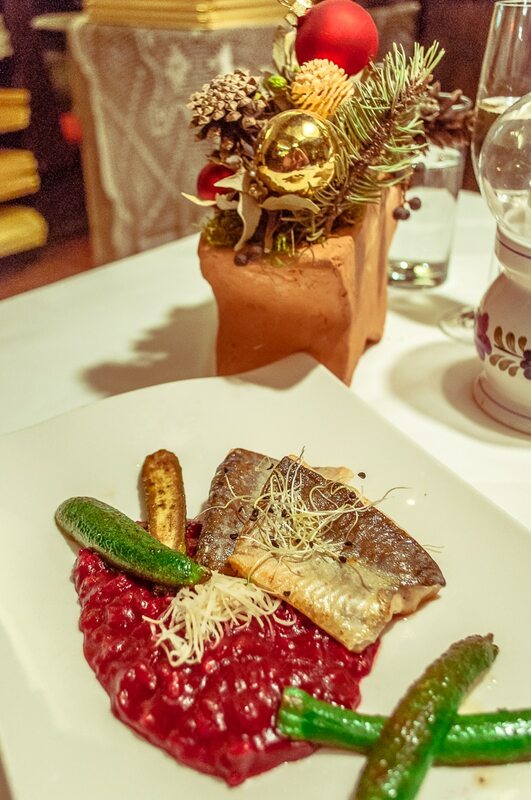 We dined on salmon trout with beetroot risotto, and sampled Schilcher wine, hazelnut schnapps and a local delicacy – Styrian pumpkin seed cream liqueur. 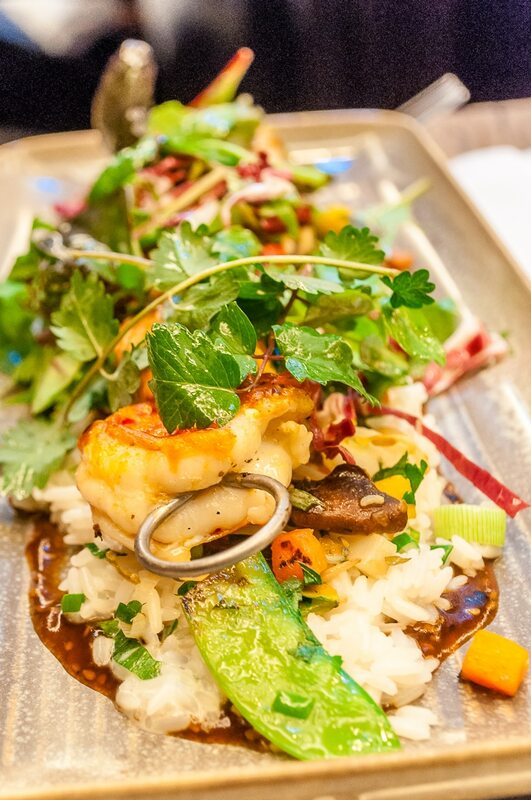 The Eckstein, is a more modern eatery, serving excellent food. Service was a bit slow, but it was very busy that night. 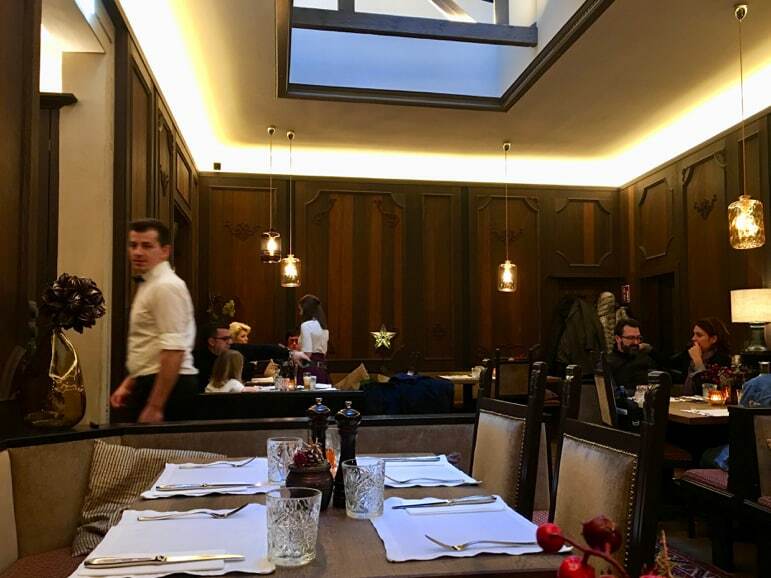 The Landhauskeller is a fabulous restaurant just off the Hauptplatz, where the food and service are first class. There I had a truly excellent grilled skewer of white catfish and prawn on Asian vegetables and a comforting coconut and young leek rice, while Sarah had crispy duck haunch with apple red cabbage, with caramelised chestnut and pretzel slice. 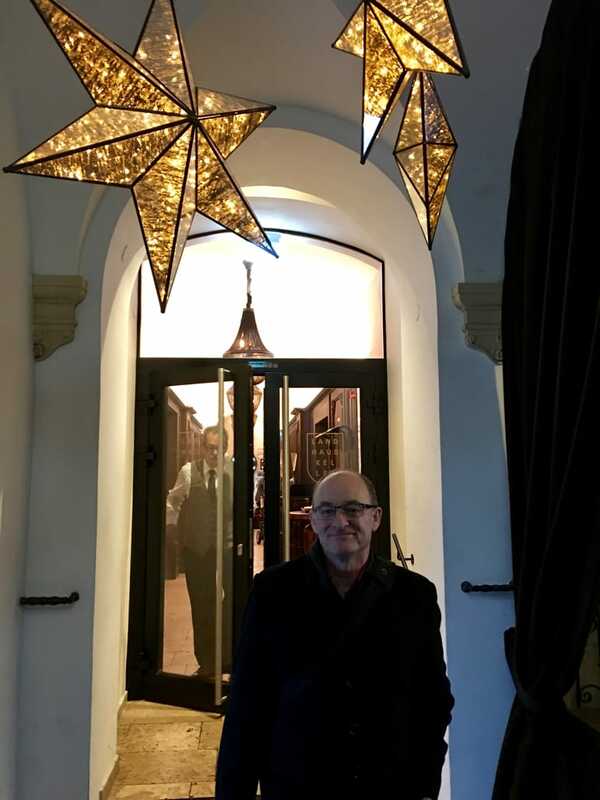 We stayed at the five-star Schlossberg Hotel. 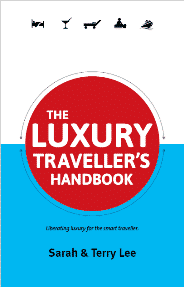 We liked it immensely, there were very friendly and helpful staff, nice art work throughout, lovely rooms, a spa, an abundant choice of foods for breakfast and the bar was open 24 hours a day. 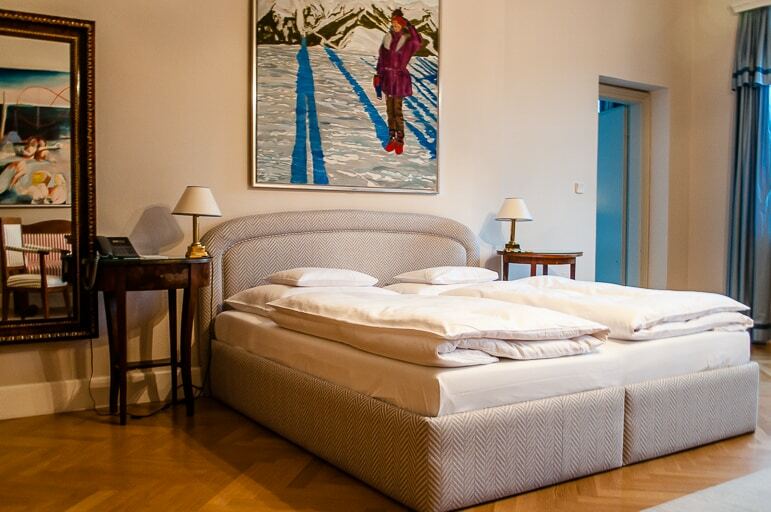 Its location was very convenient, only a five-minute walk to the town centre and one minute to the funicular which takes you to the top of the Schlossberg.